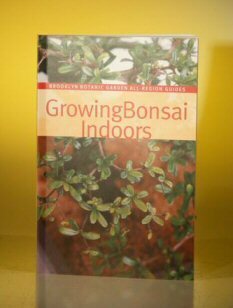 "Growing Bonsai Indoors" is an introduction to beautiful tropical and subtropical bonsai that can thrive inside your home year-round. Tailored to the needs of first time bonsai growers, this hands-on guide explains step-by-step how to make indoor bonsai flourish. You'll find a thorough overview of the most common bonsai styles fully illustrated with color photos and line drawings, as well as advice on wiring and prunning from renowned experts. This handy guide also serves as a helpful reference for buying bonsai and connecting with other enthusiastics locally and around the world. Illustrated introduction to bonsai styles and prunning techniques.